I’ve shared a quite few brownie recipe here on the blog. Maybe a little too much…. I can’t help it! We are a family of brownie lovers. I mean is there anything in the world better than brownies? 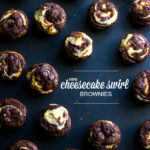 Yea, I don’t think so..
Just when I thought brownies couldn’t better- along came these delicious mini cheesecake swirl brownies. 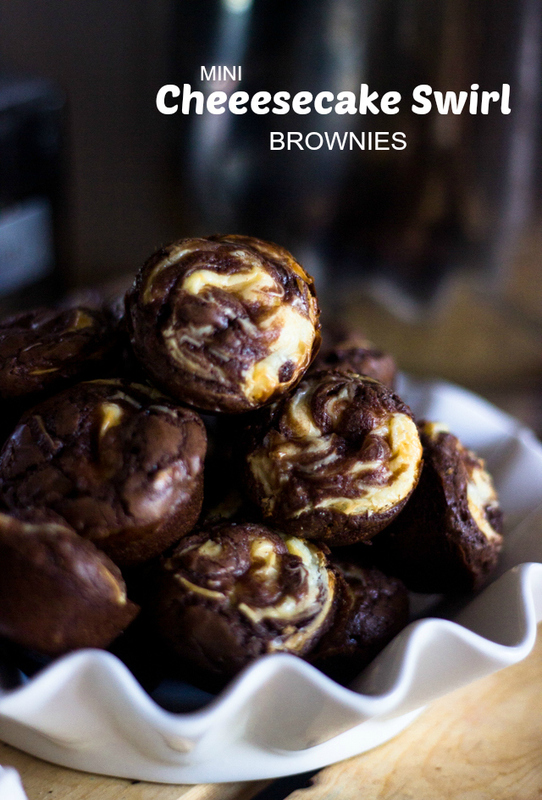 It’s just like a brownie except in a smaller more compact form with a creamy cheesecake filling. I baked these little bites with my daughter over the weekend and she literally finished half of them before I even had a chance to packed some up for her snack time. I managed to pack a few brownies in two snack size ziplock bags (4 fit perfectly in one bag) for her as a snack for school. This recipe is for 24 MINI brownie bites. You know the really small cupcake pan? If you don’t have one of these mini cupcake pans you can also use 12 cupcake tins and bake the brownies for about 5 minutes longer. Preheat oven to 350F. Grease a mini-muffin tin (24), set aside. In a medium-sized glass bowl set on top of a pot of simmering water, melt the chocolate and butter. Stir together until smooth.Remove from heat and whisk in the sugar. Add the eggs one at a time and whisk in until smooth. Stir in the vanilla. Pour the flour, salt, and baking powder over the wet ingredients. Stir until smooth and well-combined (be careful not to over mix). Beat together the softened cream cheese with the egg yolk and sugar until super smooth and clump free. Fill each muffin well 1/2 way full of brownie batter. 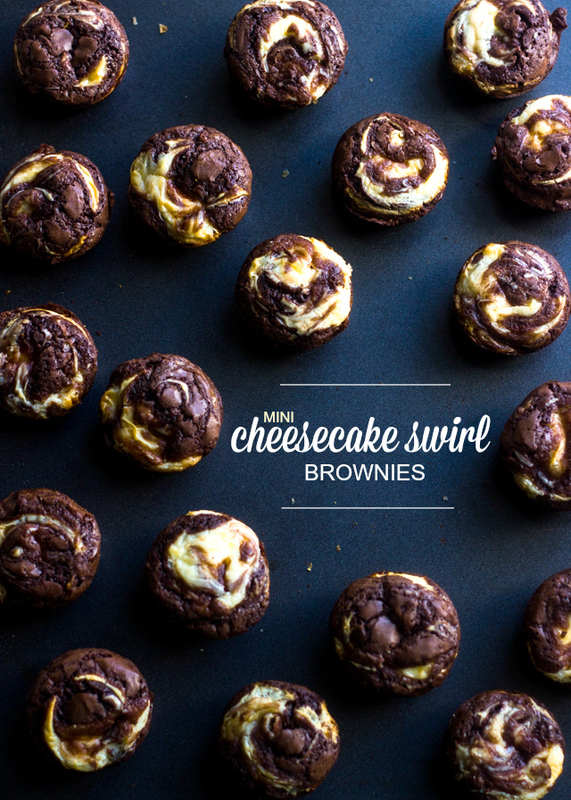 Pipe a layer of cheesecake batter on top of the brownie, and then add another large dollop of brownie batter. 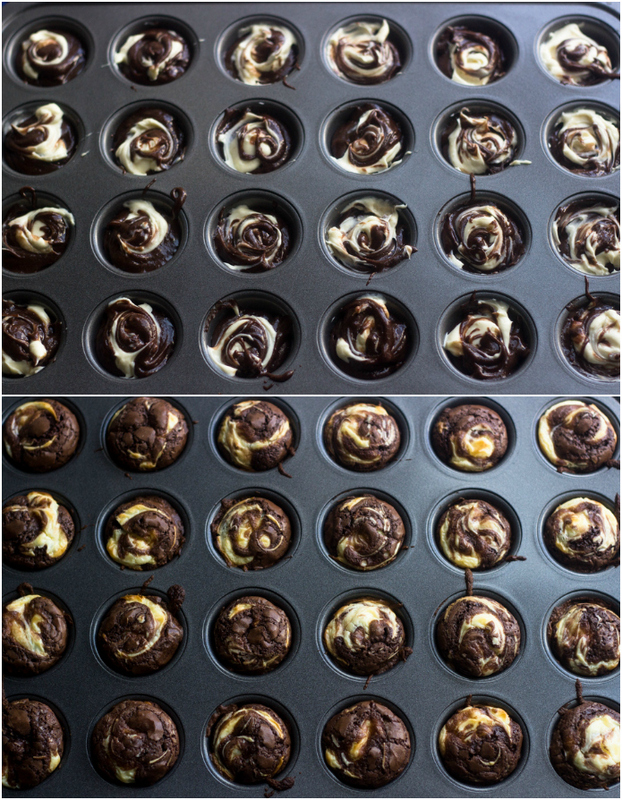 Use a fork or toothpick to swirl the batters together. Bake for 15 minutes, or until a toothpick inserted comes out clean. Enjoy! Oh heck yes!!! These are amazing!!! I would pop a dozen (easily) in my mouth right this second. Pinning! These brownies are seriously stunning!! That is a very nice idea!